T-3000 Tornado Foosball Table | Fun! The Tournament 3000 Foosball Table from Tornado is the competition table that redefines industry standards for exceptional quality, strength and durability. The Tornado Tournament 3000 is built for competitive play with a rugged, commercial grade cabinet, thick heat treated, chrome-plated hollow steel rods, patented Tornado counterbalanced players and a scorekeeper that records score and game count. The official table of the Tornado National Tour, and the preeminent name in foosball competition, offers enhanced precision and ball control as well as a non-slip, eight-sided handle for comfort, stability and smoother play. The Tournament 3000 Foosball Table from Tornado is the competition table that redefines industry standards for exceptional quality, strength and durability. The Tornado Tournament 3000 is built for competitive play with a rugged, commercial grade cabinet, thick heat treated, chrome-plated hollow steel rods, patented Tornado counterbalanced players and a scorekeeper that records score and game count. 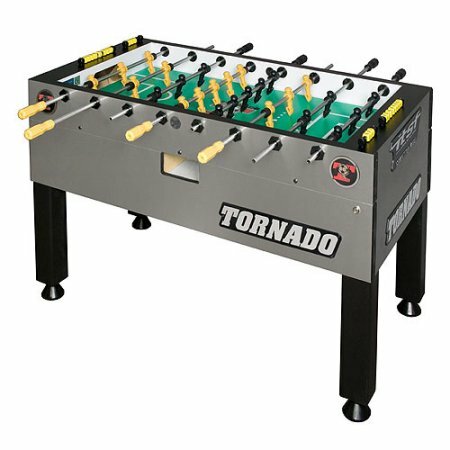 The official table of the Tornado National Tour, and the preeminent name in foosball competition, offers enhanced precision and ball control as well as a non-slip, eight-sided handle for comfort, stability and smoother play. Foosball Table Dimensions: 56” L x 30” W (70” including rods) x 36” H / Weight: 355 lbs.